Overall The $100 Startup is worth the read. But more importantly – take action! Follow Chris Guillebeau’s advice and start doing something today. 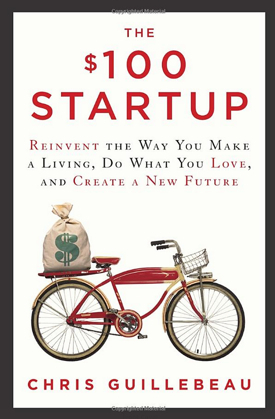 One of the other students, in the HTML/CSS beginner class that I am doing at Starter League, suggested that I read $100 startup. It is written by Chris Guillebeau, and was done after research he did with more than 1500 business owners. The book offers some great motivations and is in many ways very similar to The 4-hour workweek by Timothy Ferriss. He tells the stories of many of the people included in his research; why they’ve started, how they’ve started and grew from there. I found the first half of the book to be really good and inspirational. He encourages actions and talks a lot about finding the point of convergence between what you love to do and finding something others are willing to pay for. In The $100 Startup he also explains this idea of selling emotional benefits of your product instead of the descriptive features. The examples he gave here illustrated the point perfectly, like a ranch that sells “Be a cowboy” instead of “take a horse ride”. I found the second half of the book a little slow going. Sometimes this type of self-help book does a great job motivating action but then slows down too much in order to try and convey very practical advice. I am sure that it is great for some people that are looking for that type of practical advice. My own take is that motivation is the biggest stumbling block. Once you take action your learn to solve the many problems that cross your path once you get going. Learning to solve some of the potential problems while you are still standing still is pointless. This entry was posted in Book Reviews, Lifestyle Books, Reviews on 2013/08/22 by Justinus.